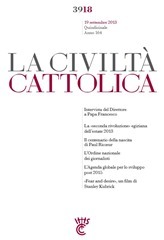 The Holy Father’s interview published recently in La Civiltà Cattolica, the Jesuit periodical that is considered one of the official organs of the Vatican, has certainly captured the attention of the worldwide media, in particular because of his comments on abortion and other social issues. For although the Church’s principal activities are the pastoral work of our parishes, Catholic education, social services and health care — which serve millions — people can sometimes have the impression that all the Church’s focus is on moral questions, particularly those concerned with sexuality. There is a danger of reducing Christianity to some sort of a moral system. We are much more than that. Our mission is to take people to Christ and, discovering Christ and his love for us, our hope is that people then embrace his way of life. As Jesus said, “If you love me you will keep my commandments”. So, the commandments are the roadmap for a good life. However, the Church’s mission is not just to be ethicists or moralists, but to lead people to the Lord and to a life of discipleship. In today’s world we must promote the Catholic way of life which is increasingly alien in the secular world, where our concern about unborn children or the sacredness of marriage makes us appear quaint and even nettlesome. We need mentors: parents, grandparents, Godparents, teachers, youth ministers, neighbors, who are ready to pass on the faith. Pope Francis is calling on us to embrace the vision of reality that is the Church’s faith and that values each and every human being, and stresses our responsibility to love and serve each other, especially the most vulnerable in our midst. The word that Pope Francis repeats over and over is “tenerezza”, tenderness. On the Feast of St. Joseph, in his inaugural Mass he speaks to us about protecting people, showing loving concern for each and every person, especially children, the elderly, those in need, who are often the last we think about. He says: “We must not be afraid of goodness or tenderness.” He points to the heart of Joseph, his tenderness which is not the virtue of the weak but a sign of strength of spirit and a capacity for concern and compassion, for genuine openness to others, for love. Some people think that the Holy Father should talk more about abortion. I think he speaks of love and mercy to give people the context for the Church’s teaching on abortion. We oppose abortion, not because we are mean or old fashioned, but because we love people. And that is what we must show the world. Recently I read about an American relief worker in Africa, who reported on being at a camp for a food distribution line, it was very chaotic, even scary. He could see that they were running out of food and that these starving people were desperate. At the end of the line, the last person was a little nine year old girl. All that was left was one banana. They handed it to her. She peeled the banana and gave half each to her younger brother and sister. Then she licked the banana peel. The relief worker said at that moment he began to believe in God. We must be better people; we must love all people, even those who advocate abortion. It is only if we love them that we will be able to help them discover the sacredness of the life of an unborn child. Only love and mercy will open hearts that have been hardened by the individualism of our age. … When the Holy Father went to the island of Lampedusa he threw a wreath of flowers into the sea where thousands of refugees have perished in the modern day coffin ships that bring refugees from North Africa. The Holy Father talked about the globalization of indifference – indifference to the suffering of others, to the fate of the unborn, the elderly, the handicapped, the mentally ill and the immigrants. On the other hand, however, the truth without mercy would be cold, offputting and ready to wound. The truth isn’t a wet rag that you throw in someone’s face, but a warm cape that you wrap around a person, to protect and strengthen them. Project Rachel has been just that kind of a combination of mercy and truth that the Church’s pro–life efforts need to be about. Our efforts to heal the wounds of society will depend on our capacity to love and to be faithful to our mission. The Holy Father is showing us very clearly that our struggle is not just a political battle or a legal problem, but that we must evangelize and humanize the culture, then the world will be safe for the unborn, the elderly and the unproductive. The Gospel of Life is a Gospel of mercy. If we are going to get a hearing in today’s world, it will be because people recognize that authenticity of our lives and our dedication to building a civilization of love. We are called to live our lives as a service to others and commit our lives to give witness to the presence of God’s love and mercy in our midst. I also want to recommend the article “The Christ Centered Pope” by George Weigel. In it, he gives an excellent analysis of the Holy Father’s remarks. We are very saddened by incidences of gun violence in our nation this week, particularly the shooting at the Navy Yard in Washington D.C. Once again, these events underscore the danger of not dealing with the proliferation of firearms among the general population. It is regrettable that, as a country, we have yet to find solutions that will protect our population from this sort of massacre. The Washington incident, as is the case with many others, appears to have been perpetrated by a person with mental illness. This incident serves as another call for society to increase our care and services for people who face these types of issues. Before being named to the commission of Cardinals to advise the Holy Father, I accepted a couple of engagements that I probably would not have otherwise. But this week, I had three important celebrations that I was a part of. 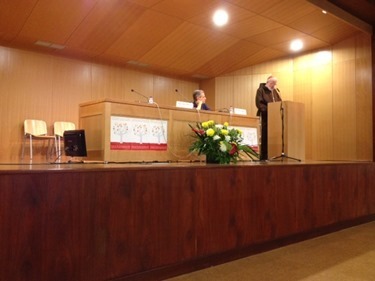 The first one was to give the closing talk at the 28th Encontro da Pastoral Social. 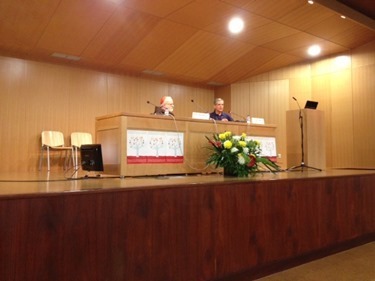 This is an annual event sponsored by the Bishops Conference of Portugal, at which they gather those involved in pro-life ministry, Catholic charities and other social ministries of the Church throughout Portugal. 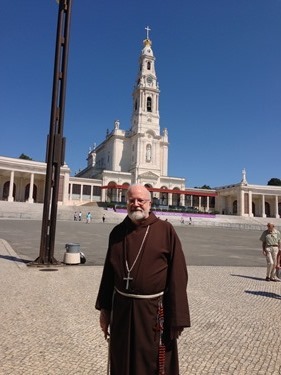 The bishop who heads the Comissão Episcopal Pastoral Social is Archbishop Jorge Ortiga, who is the Primate of Portugal and the Archbishop of Braga, a diocese that dates from the 300s. The priest in charge of organizing the event was Father José Manuel Pereira De Almeida. 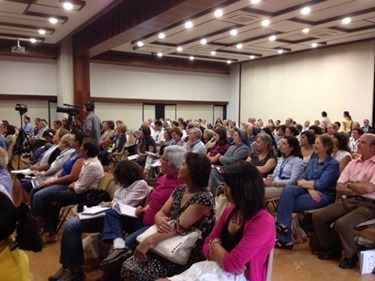 I gave about an hour talk, speaking about the social teachings of the Church and connecting them particularly to pro-life issues. 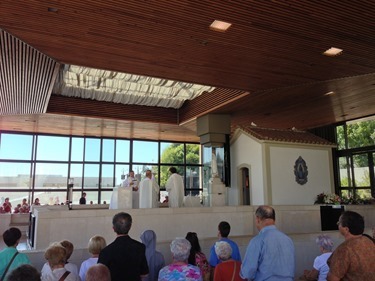 Like so many of the important events in the life of the Church in Portugal, it takes place in Fatima. The conference happened to take place on the 12th, the beginning of the monthly pilgrimage to the shrine. As many people realize, the apparitions at Fatima took place on the 13th of every month from May through October, so that date is memorialized by very large events. During my visit, I was able to visit the grotto. There, I prayed the rosary in a very special way for the priests, religious and people of Boston and asked Our Lady to help us in this Year of Faith. 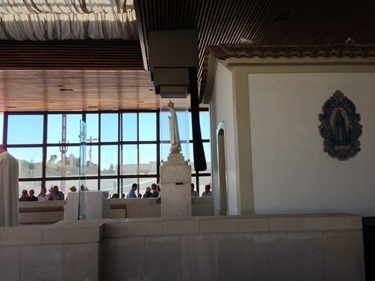 This is a picture of the Capelinha das Aparições (the Little Chapel of Apparitions) and the statue Our Lady. That statue will be taken to Rome in a few weeks for the October 13 event in which the Holy Father will consecrate the world to Immaculate Heart of Mary. Although it was a very short visit, during my time in Portugal I was able to give First Communion to two children whom I had baptized, Bernardo and Marta Cortez Lobão. 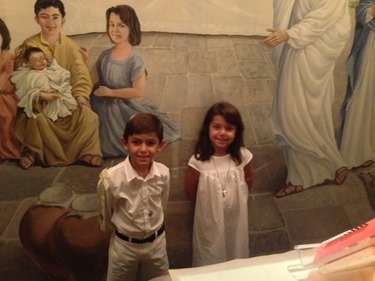 They are two of the eight children of João and Maria Cortez Lobão. Their mother was one of my catechists at the Portuguese Parish I had in Washington. 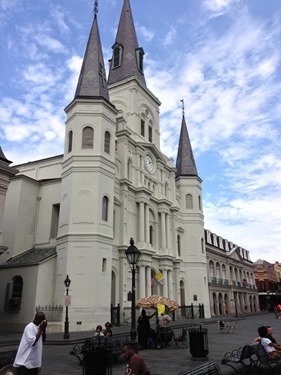 From there, I went to New Orleans, where I had been invited to address priests at the Louisiana State Presbyteral Convocation. 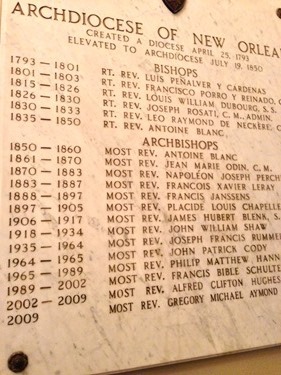 Every four years, in New Orleans they gather all the priests of the province, which consists of seven dioceses, for the convocation. 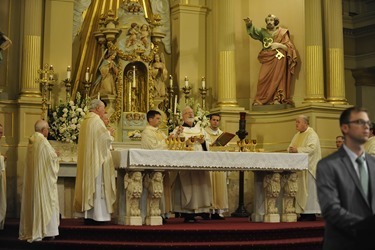 In all, there were about 400 priests present at the event. In my remarks, I spoke to them about the ministry of the priesthood, especially the new evangelization and importance of preaching. It was a wonderful event and there was a great spirit among the priests. While I was there, I met Betty-Ann Hickey, who is originally from Fall River and who works at the Clergy Office in New Orleans. Her husband, Dennis, will be ordained a deacon next year. 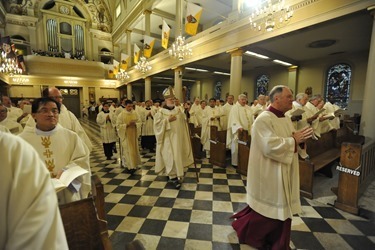 As part of the convocation, I celebrated Mass for the priests at the Cathedral of St. Louis de France. Joining me were the seven bishops of the province, including New Orleans Archbishop Gregory Aymond and Archbishop Al Hughes, originally from Boston, who is the Archbishop Emeritus of New Orleans. The Cathedral of St. Louis de France is a beautiful building and an iconic landmark of the city. Thankfully, it was untouched by the ravages of Hurricane Katrina. In colonial times, before the advent of modern flood control measures, people built on the high ground. I experienced the same thing in the Virgin Islands were all the colonial buildings were built on high ground, while in modern times, the impetus was to build towards the water. The Cathedral has special meaning for me because the Capuchin Friars worked there for about 100 years. In fact, I learned that the first resident bishop in United States was a Capuchin friar in Louisiana, ordained a bishop five years before John Carroll in Baltimore. 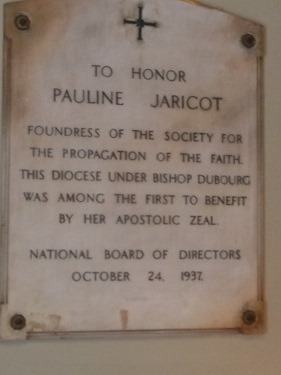 They have a monument honoring Pauline Jaricot, the foundress of the Society for the Propagation of the Faith. I took note of that because when we celebrated the bicentennial of our own archdiocese, I became aware of the fact that the Society for the Propagation of the Faith in France was very generous with the Diocese of Boston. We have letters from the time from Bishop Fenwick to the Society in Paris asking for assistance. 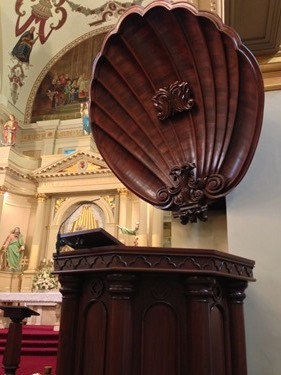 The pulpit has this huge shell behind it, which was something like the original Bose stereo sound system! The shell placed behind the preacher was to help project his voice. In many of the larger churches in Europe the pulpit is often in the very center of the church, along the side, precisely for the acoustics because, of course, there were no sound systems. 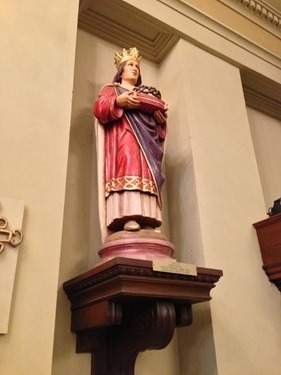 This is a picture of St. Louis with the Crown of Thorns. St. Louis brought the crown of thorns to Paris and built the Sainte Chapelle to house it. 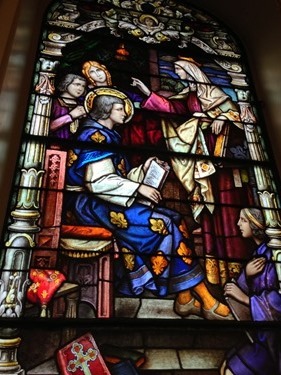 All of the stained-glass windows in the cathedral depict the life of St. Louis of France. This is a picture of the young St. Louis with his mother, Blanche. 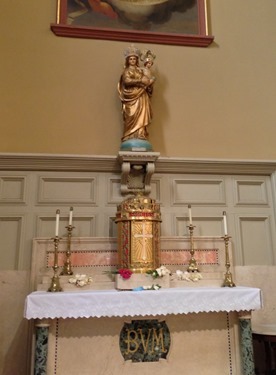 This is the Blessed Sacrament Chapel, which contains the statue of Our Lady of Prompt Succor, as they call it, who is their patroness. 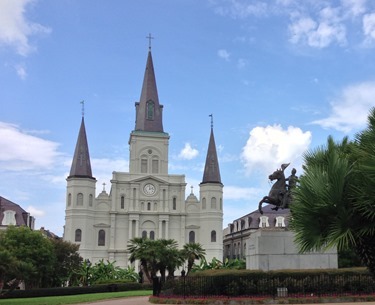 In the picture of the Cathedral from the outside you can see this statue of Andrew Jackson mounted on a horse. 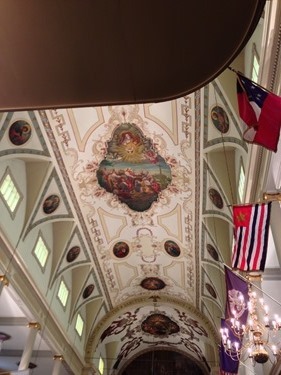 They say that when he won the Battle of New Orleans he attributed the victory to Our Lady of Prompt Succor and that, since he had a very poor army, it must have been due to the prayers of the Ursuline Sisters, who kept vigil during the night praying to Our Lady! 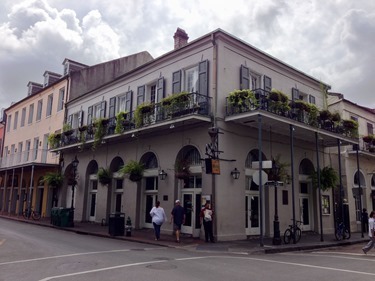 I also wanted to share with you this photo, which is just a typical street corner in the French Quarter of the city. It just struck me how much the architecture is like the old architecture in St. Thomas in the Virgin Islands, a two-story structure with wrought iron balconies. 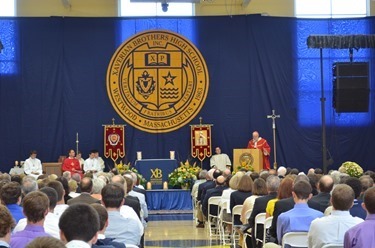 The third major event of the week was the 50th anniversary celebration of Xaverian Brothers High School in Westwood, which took place earlier today. 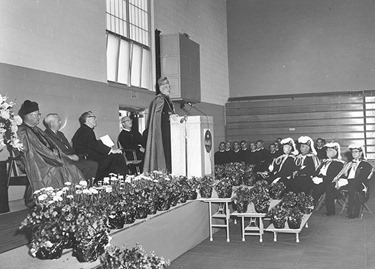 Since the Xaverian Brothers’ provincial Brother Gilroy and the first headmaster Brother Marcellus dedicated the school with Cardinal Cushing in 1963, the school has been very successful. That success continues even to the modern day, as is shown by the remarkable technology program they introduced last year. Now the classrooms have what are called Smart Boards (which are like big tablet computers on the wall) where we would normally expect to see a blackboard. Using these Smart Boards teachers and students can collaborate in a very interactive learning environment. 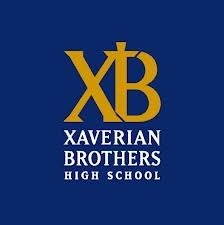 We are very grateful to the Xaverian Brothers for their commitment to Catholic education. They have a very proud tradition. The order was founded in Belgium with a missionary thrust, particularly to work among Native Americans. However, when the founder, Theodore Ryken, came to the United States, he realized the need was to educate the children of immigrants. 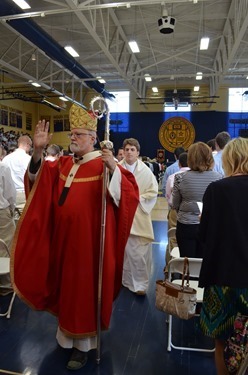 That is a mission that the Xaverian Brothers here have dedicated themselves to ever since. They have a glorious history here in the archdiocese and were very happy to celebrate the 50th anniversary of this fine school. Finally, I want to mention that tomorrow, Saturday, September 21, we will have the joy of ordaining 12 new permanent deacons at the Cathedral the Holy Cross. The Year of Faith is the anniversary of the Second Vatican Council, and one of the great fruits of the Council was the restoration of the role of the permanent deacon in the Church. This has proved to be such a blessing for us. Here in our own archdiocese, deacons are carrying on extraordinary service to God’s people in our parishes, prisons, hospitals and many other venues. We invite everyone to lift up these men, their wives, and their families in our prayers, especially that the Lord will bless them for their generous response to their diaconal vocations. 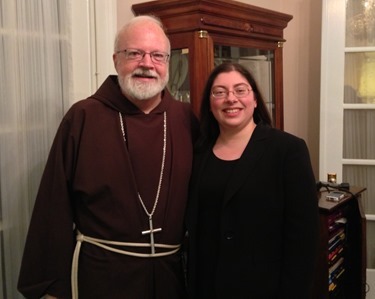 Dear Caradinal O’Malley: I wish you “Godspeed” on your trip to the Vatican to meet with the other seven members of the newly formed council. 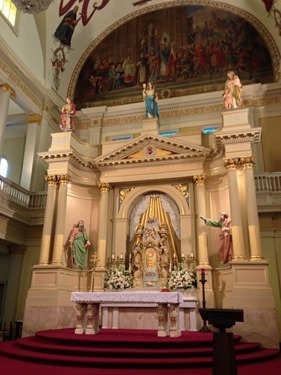 You blessed my granddaughters at St. Therese de Lisieux Church when our small congregation was meeting in a public middle school in Wellington, FL. On that day, I told them that they have been blessed by a man who will become pope one day. So, you can imagine how blessed we all are to have you work so closely with Pope Francis, who is such a miracle from God. Thank you and Pope Francis for your humility and love for children. I know you will do all you can to keep them safe within the Catholic Church. Your work in Boston has proven that. How is silence merciful to the unborn? Would enjoy receiving the Cardinal’s Blog. Thanks for such a great explanation, Cardinal! Thank you for the wonderful outline and your words of wisdom and inspiration. As a physician and with the help of the Church, and Card. Peter Turkson, I have committed my life to the service of the poor in Africa. We are striving to help them develop better medical care through corporal works of Mercy but also by providing the means for them to help themselves. We are answering the call for caring and compassion that men of means must answer to be faithful to the teachings of Jesus. Thank you for this much needed explanation! I am new to Twitter and discovered your Tweet today, which makes the whole idea of joining Twitter worthwhile. 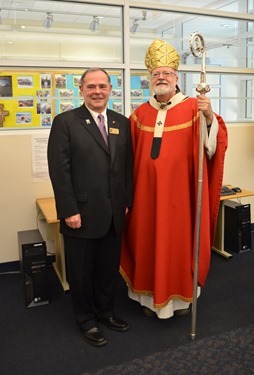 A Good Shepherd leads, and I have been following your lead since first being among the crowd that welcomed you at Our Lady of Florida when you became Bishop of Palm Beach. I have tried to rev up my virtues by observing yours. You are the first I have heard of who dresses simply, sells mansions and espouses humility. Thank you for such good example! I shall look forward to reading your tweets and blogs. 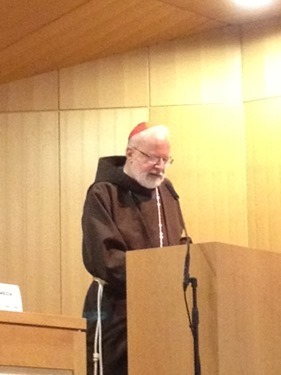 Cardinal Sean, thank you for your trip to New Orleans, and the beautiful commentary. Your Homily was quite inspiring, and all the Priests I’ve spoken to have taken it to heart, with a deep appreciation of your ministry. Also, I appreciate you’re agreeing to my taking of your picture when I bumped into you in the elevator! Many thanks… in Christ.